Edward Scissorhands is a fairy tale/fable that lies somewhere between a retelling of Frankenstein and Pinocchio. It's more straightforward than you might expect from the mastermind behind Mars Attacks! and Beetlejuice, and it's also sweeter in many ways. But the main thrust of Frankenstein and Pinocchio are there, minus the anti-technology message but including the other subtexts of the "monster" and its relation to society. Knowing Edward Scissorhands' inspirations, it may be difficult to give spoilers, but if you want absolutely none, skip to the next paragraph. The story, told more chronologically than Burton and co-scripter Caroline Thompson relay it, concerns an eccentric inventor (the Dr. Frankenstein/Gepetto role), played by horror icon Vincent Price, who lives in a gothic castle on a hill overlooking a stereotypical suburb. His main hobby appears to be making cookies with an elaborate Rube Goldberg contraption. One day a heart shaped cookie gives him an idea of creating a boy from one of his baker automatons. He creates Edward, going so far as teaching him etiquette and reading poetry to him, but the inventor passes away before he can finish, leaving Edward with huge scissors in place of hands. Edward lives in seclusion until the local Avon Lady, Peg Boggs (Dianne Wiest), desperate for business, decides to finally approach the town's "haunted" mansion. She feels sorry for Edward, who she immediately recognizes as harmless, and invites him to come down and live with the plain folks. Edward Scissorhands concerns the problems that ensue as Edward tries to adjust to suburbia and vice versa. To an extent, Edward Scissorhands is a critique of conformity. At least it seems that way at first, but Burton is more complex than that. He's doesn't completely dismiss keeping up with the Joneses and fitting in, in fact, he seems to embrace it to an extent. Which makes sense, because by his own admission, Burton grew up in a neighborhood similar to the Boggs', which likely gives him a soft spot in his heart for it, despite his being Edward Scissorhands to the rest of the crowd. Yes, most of the small suburbia has mistaken views about Edward, and at least one person is overtly cruel towards him, but they all tend to have mistaken views about each other as well--it's almost par for the course, as no one really fits into the rules of the game exactly, but they all pretend to and try to normalize differences far enough to make them inconsequential, because it is easier that way. Edward Scissorhands (Johnny Depp) makes himself at home. 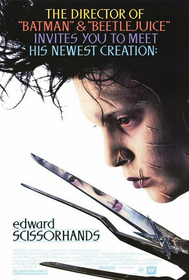 Interestingly, Burton is not only being autobiographical about his history in Edward Scissorhands, but the film carries its themes throughout more subtle levels. Edward's gothic home, including the land it sits on, is typically Burtonesque in art design and architecture. When Stefan Czapsky's masterful cinematography takes us there, we, and Peg Boggs, may as well be in Batman Returns or The Nightmare Before Christmas. But that characteristically Burton world is taken out of its comfort zone in the guise of Edward and placed smack in the middle of anywhere, USA, even if the sets and production design are more suited for a John Waters or David Lynch mockery of it. Just like Edward, the Burtonesque elements, represented by Edward's shrubbery and hairstyling "handiwork," never quite fit in. In the end, Edward Scissorhands is ultimately a tragedy, but one that rests in more of a melancholy resignation at the realization that some things just won't mesh and are best left as they were, apart from the conventional wisdom which will keep chugging away and perhaps admire the square pegs from a safe distance. It's a more hopeful ending than Frankenstein--the mob marching on Frankenstein's castle is more easily turned away here, even if most of them know they're being duped (it's another instance of normalization for ease)--but less so than Pinocchio, which also makes Edward Scissorhands more realistic. There are superficial horror trappings here, but deeper ones, as well, it's just that they stop in the same melancholy resignation. 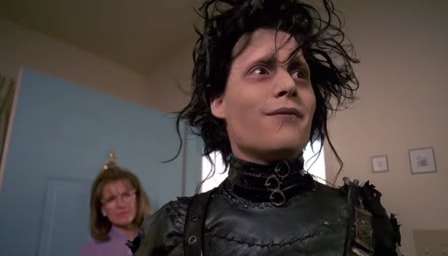 Of course, as a Burton film, Edward Scissorhands looks beautiful. As one of the many Burton films scored by Danny Elfman, it also sounds wonderful--magical, even. Johnny Depp is at his best here, playing a role that he understands as well as anyone, and this isn't his best performance only because he's had so many great ones in his career. 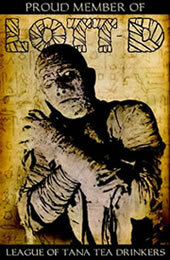 The rest of the cast is excellent, as well; even the smallest parts, like the wacky religioso, are top notch. Edward Scissorhands is a film that you can watch at any level, from pure simplistic entertainment to a complex commentary on the world from Burton the sociologist. It's also a film that children should love it as well as adults. Even for those who don't always like Burton's films (I have to admit that I can see why Mars Attacks! isn't to everyone's taste, even if I love it), Edward Scissorhands is a must see.